DPP Series Pneumatic Gripper is a parallel 2-jaw gripper with excellent parallelism and accuracy between the gripper mounting surface and jaw surface. Jaws are front mounted and are supported with "Dual-V" roller bearings to provide low friction motion and are preloaded for maximum support and zero side play. They are also available with optional spring assist on the close stroke to prevent the part from being dropped in case there is a loss of air pressure. 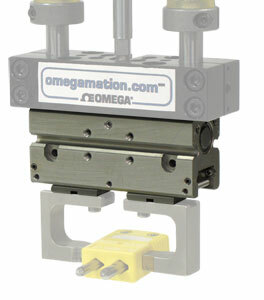 The DPP pneumatic gripper is a modular automation component and can be mounted to the DTL Linear Slides or the DRF Rotary Actuators without additional adaptor plates. They are available in stroke lengths from 6.4 to 25.4 mm (0.25" to 1.00") with a gripper force ranging from 111 to 214 N (25 to 48 lbs). They can be mounted on the top or side to support mounting and operation in any direction and have air ports on the top, side and front . Top manifold air ports can be used to help eliminate tubing and fittings at the gripping location. Accessory mounting slots make it easy to add magneto sensors and inductive sensor kits are available, the grippers have built in slots for inductive sensor targets. Pnuematic linear motion components are double acting air cylinders that require a dry air supply with filtering to 40 microns or better. For best control of pneumatic components, flow control valves (regulating out) should be installed to regulate the speed of the device. Position sensors can easily be added to motion components to detect the end of travel positions of the slides, they are the standard method of communication with the PLC and are available in inductive or magneto resistive sensing styles and come in both PNP or NPN sourcing signals. Excellent Accuracy Excellent parallelism and accuracy between gripper mounting surface and jaw surfaces. Accessory Mounting Slots For Magneto Resistive and Inductive sensors (sensors sold separately). Superior Jaw Support Jaws are supported using our patented "Dual-V" roller bearing design. Hardened Plated Jaws For wear resistance and longer life. Dowel Holes H7 dowel pin holes in body and jaws. Jaws also have key slot for better finger alignment. Multiple Sensor Capabilities Capable of sensing both jaws in the open and closed positions (up to 4 sensors can be used for multi-position sensing). Sensor magnets on pistons come standard for Magneto Resistive Sensing. FKM Seals Available for high temperature applications. "Dual-V" Roller Bearings Provide low friction motion and are preloaded for maximum support and zero side play. Standard Purge/Scavenge Port Used with a vacuum for clean room environments or positive pressure for harsh environments and jaw surfaces. Top Manifold Air Ports Eliminates the need for airlines. Shielded Design Shielded design repels contamination from penetrating the "Dual-V" roller bearings. Hard Coat Anodized One piece, aircraft quality aluminum body, has hardcoat anodize 60 RC with PFA impregnation. High Grip Force with respect to weight due to extremely efficient drive mechanism. Mounting Patterns DIRECTCONNECT tapped and dowel mounting surfaces on top and side of body. Optional Spring Assist For close stroke. Adjustable Pre-load Screws Allows for adjustment of preload on roller bearings. Note: All models have a temperature range of -35 to 80°C (-30 to 180°F). The temperature range can be modified to -30 to 120°C (-20 to 250°F) with FKM® seals. Add "V" to the end of the model Number and $36. All models come standard with snychornous jaws, if non snychornous is required consult sales. All models with the "-C" option have a spring assist closing mechanism on the jaws to provide fail safe closing and additional gripping force.